Karl Sabbagh. Farrar, Straus & Giroux, New York, 2000. A true scientific detective story that is enjoyable and exciting, while managing to say quite a lot about what science is, and how it should be done. Half a century ago, John Raven, an upper class British classics scholar and Master at Kings College, Cambridge did a nice bit of detective work. It started as a lark, but Ravens questions gradually grew into a full-fledged investigation. 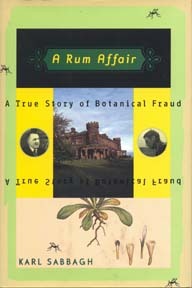 Raven, an avid amateur botanist, grew to suspect — an eventually prove — that a distinguished British professor of botany, Heslop Harrison of the Royal Society, was a fraud. Harrison, Raven discovered, had introduced alien sedges on the Hebridean island of Rum in order to advance Harrisons pet theory that plants from before the ice age had survived in Great Britain. After writing a fiery report detailing Harrisons fraud, Raven sealed it in his college library! Sabbagh, reading Ravens obituary, saw a brief mention that Raven had produced a damning unpublished report about  a reputable biologist, and this book is the result. It is a marvelous look back at science in Victorian times, when class meant a great deal more than it does now. At a deeper level, it offers a vivid dissection of scientific fraud. A short, wonderful book.